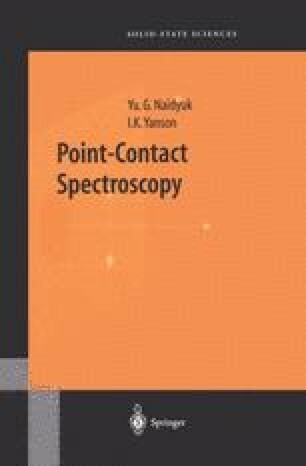 Different types of the point contacts have been developed during elaboration of PCS method. The pioneering measurements were carried out by Yanson (see also Section 2.2) at the beginning of the 1970s exploiting thin film junctions. Here two evaporated in-sequence metallic films (the first one being oxidized before evaporating of the next one) were electrically isolated by oxides. The oxide layer on a metal, as a rule, is a few nanometers thick and serves as a good and strong dielectric. This structure is called a sandwich-like tunnel junction, and it is widely used as a tool by physical researches (see Section 2.2). If the oxidation is strong, the dielectric layer will be thick and the tunneling current negligibly small. By reducing of oxidation time, the appearance of “holes” in the oxide becomes possible; i. e., the conductivity between metallic films is not stipulated by the tunneling but by the current flowing through the metallic shorts. Such contacts have naturally to be rejected as far as they are not suitable for the tunneling investigations.